OK all you racing enthusiasts out there, it's time to get ready for the nail biting, hair pulling, knock down, drag out event of any holiday here. Yep, its time to go crab racing! This event is not for the faint of heart, and it is highly advisable to have some type of 'alcoholic' drink at hand (for medicinal purposes,of course). Don't forget to bring along some cash, as there is money to be made or lost at this event. Bets are cash only, and you cannot use your spouse as collateral (begging the race official to accept this type of deposit will only result in you being sent to your room). Cheering and otherwise encouraging your racer is quite o.k., just bear in mind that the crabs are deaf and won't hear anything anyway. 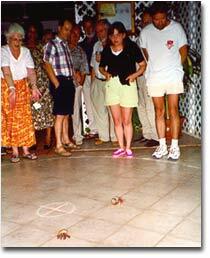 Crab racing is usually held at several of the hotels, but we recommend the Watering Hole Bar at Kalinago Resort, where it is orchestrated by the manager, who is also the referee, bookie and race official. Mainly held in the high season (the crabs are turned out to pasture, which means thrown back in the sea, unharmed, till needed again). On a Monday night, it is well attended, and everyone is welcome. At the start of the race, everyone is given a chance to inspect the racers and choose the one which they feel will beat the shell off of all the rest. The racers are then christened (this just means you shout out the name you would like your choice to have, and if it is well liked, then the poor crab is stuck with it for the rest of the night) and put in the middle of a large circle, held in place by an overturned bowl so that no one tries to get a head start on the others. Once everyone is ready, the race coordinator (bookie) removes the bowl and then... LET THE RACE BEGIN!! 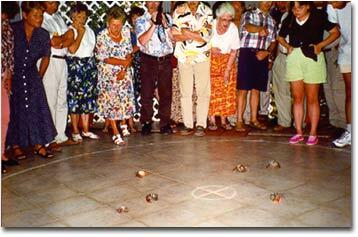 The first crab to pass the circle wins the race, and for those lucky enough to have placed a wager on that particular crab, winnings are given out accordingly. It may not be as highly regarded as the Kentucky Derby, but if you have the time, definitely fun to watch and participate in. The racing starts at 9pm on Monday night. Give the front desk a call to make sure it is happening on the day you wish to go.